Carvings on the corners and rope moulding speak to the magnificent craftsmanship that goes into Countryside's New Haven Executive Bookcase. 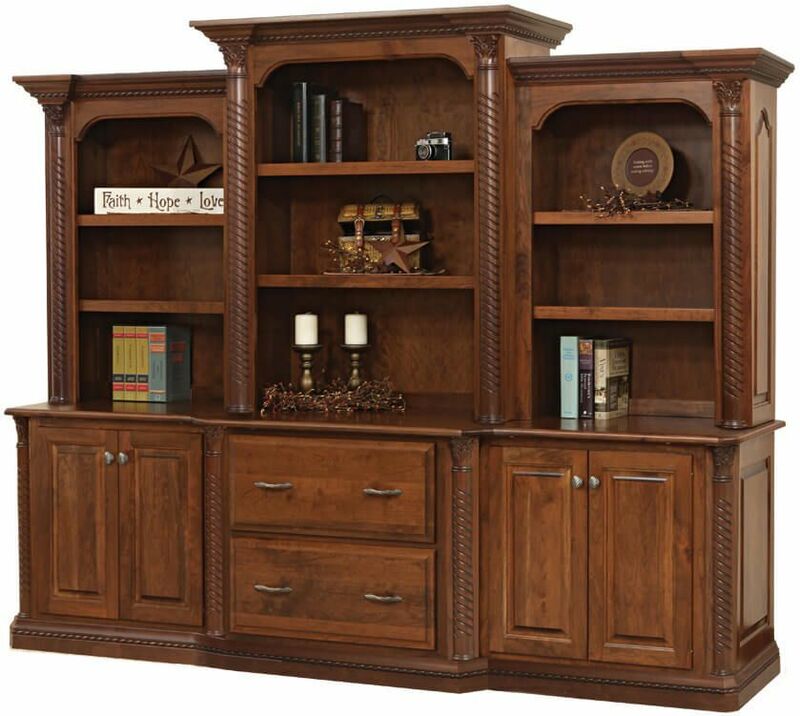 Whether you seek a credenza, bookcase, or lateral file, our New Haven Executive Bookcase may be your solution. With ornate details like raised panels, rope moulding, and braided corner posts, this Amish handcrafted piece is fancy enough for any corporate setting without being too pretentious for your home. Shown in a Devonshire finish over domestic Cherry, this stellar storage icon can be crafted out of any American hardwood listed in the menu. As part of the New Haven Office Set, this phenomenal piece can complete any large office suite or serve as lone storage in a home office. Every inch of our solid wood credenza with hutch is made to the standards for which Countryside is known. Dovetailed drawers, full extension slides, adjustable shelves, and custom hardware are all part of the New Haven package. Remember to include the New Haven Executive Bookcase in your future plans as a piece this well made will become a legacy. Let Countryside deliver a New Haven that is designed by you.